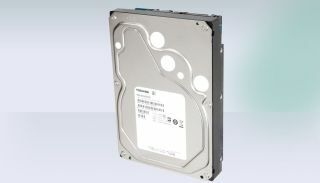 Two months after it unveiled its first 5TB hard disk drives, Toshiba has announced a new range of HDDs that has been designed with "bulk storage systems and servers that support cloud-based applications and scale-out workloads" in mind. Four models are available with capacities ranging from 2TB to 5TB with 128MB buffer size; they all use 1TB platters and are expected to handle workloads of up to 180TB per year. Compared to the MG series released earlier this year, the MC family has a slower sustained transfer speed at 170MBps compared to 204MBps. It is likely that the newly announced models will sell for less as they lack more high end features like optional SAS inteface or persistent write cache technology. Toshiba will face some serious competition on a market that has picked up steam as demand for storage on the back of the phenomenal growth of cloud storage is accelerating. Seagate and HGST have announced enterprise drives of up to 6TB. WD remains the only big storage company not to have released a drive bigger than 4TB. A 5TB enterprise drive from Seagate currently retails for around £320, while a 6TB sells for as little as £426.